Inferring can be a tricky skill to teach and learn! Here is another installment of my very popular format, Inference Riddles as previously featured in the TPT newsletter. My free sampler had more than 16,000 downloads after being featured, with many people checking out all of the versions available. Come see what all the chatter is about! 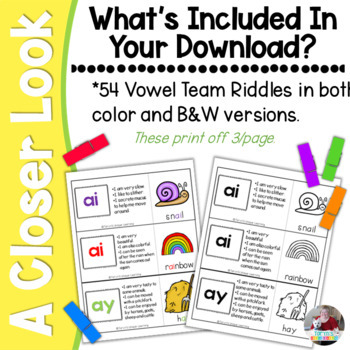 This set of riddles focuses on Vowel Teams. I have several students who are in need of structured phonics programs, and sometimes you just need to add a new twist to the way you teach the various phonics concepts. My students L-O-V-E this format. Included you will find fifty-two different riddles, available in both colored versions and black and white for your printing preferences. 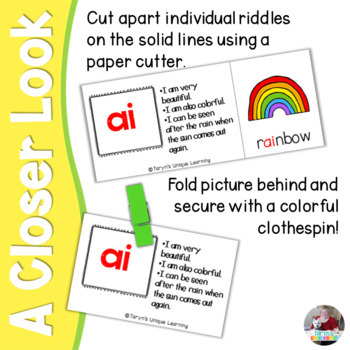 Simply print, laminate if you wish, cut apart on the shared lines, and fold back the picture/answer on the dotted line so it is not visible. Three clues are given for each answer. Read each clue to your students one at a time, while telling students what the vowel team labeled on the card is. 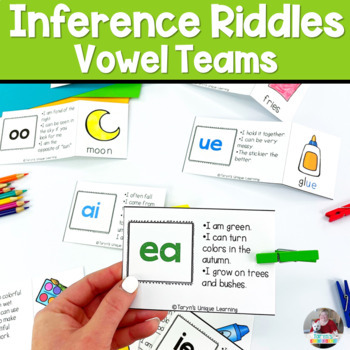 The goal is for students to take in the clues, combine this information with their knowledge of vowel teams, and to come up with the answer to the riddle. Also, the clues are written in simple text so many of your students will be able to read the clues independently. Please remember that your purchase is for a single user license. If you would like to share this with friends or colleagues, please plan to purchase a multi-user license for each as required in my terms of usage. And certainly do not forget to leave feedback and a rating in my TPT store so you can earn those TPT credits towards future purchases within any shop you choose.